We recently took delivery of the latest Fujifilm X series camera, the X100F. We bought our X100F having had chance to try out a prototype in January this year. Our good friend and official X-Photographer Kevin Mullins brought one along to a get together we arranged in Bath of several wedding photographers using Fuji gear. We were both impressed with its speed of focusing, small form factor and above all, how quiet it was. We see it as an ideal add on to our observational style of documentary wedding photography. We wanted to give our new camera a try out before our using it at a wedding, but in the same way as we would shoot a wedding. I do enjoy street photography when time permits, and being Bicester based, the ideal location seemed to be Bicester Village. 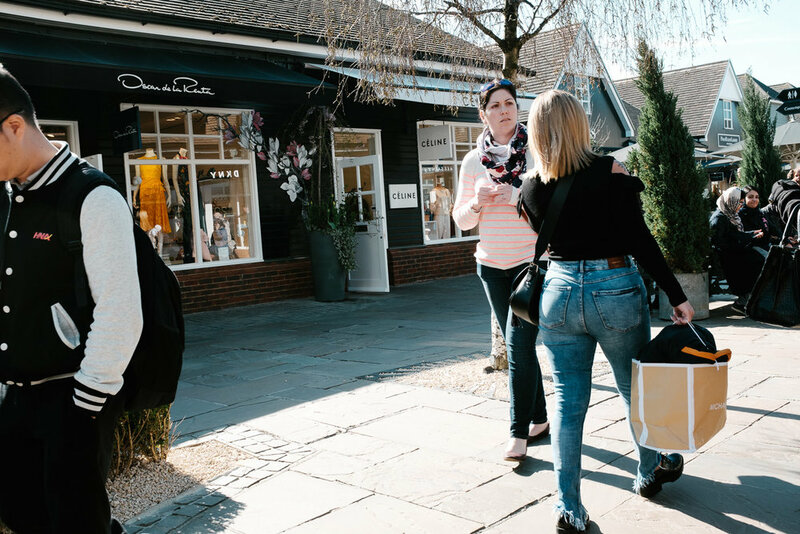 For those of you that don't know Bicester Village, its a high end retail outlet centre on the edge of the old market town of Bicester. It has grown remarkably in recent years, and is now, incredibly, the 2nd most visited location in the UK for Chinese tourists, after Buckingham Palace. Although the price tags in the shops are out of my league, it is a great place for people watching. I took along our X100F one Sunday in March, slung around my neck, looking like a tourist. My aim was to capture how busy the place is, and to portray the general atmosphere. I spend a good couple of hours walking around, making sure not to get in the way or generally draw attention to myself. My first approach was to set the fixed 23mm F2 lens of the X100F on manual focus. Using a smallish aperture of around F11, a shutter speed of no less than 1/125th of second and auto ISO, I prefocused the camera to a distance of around 4 feet away from me. My reasoning for this was that with a moderate wide angle (35mm in 35mm film "full frame" terms), and a small aperture, depth of field would ensure most of my images would be in focus. With my camera strap around my neck, with the body resting on my chest I could press the shutter button without drawing attention to myself; the silent leaf shutter of the X100F made sure of that! This approach worked quite well, with most images being sharp and in focus. However inevitably some of the photos were at a rather jaunty angle! After about 30 minutes of shooting this way, I changed approach. I had previously configured the top plate Function button on the X100F for switching on the camera's built in Wifi transmitter. Fujifilm does offer a free iPhone/iPad app for control and image capture direct from the Apple App store. We use this at weddings when the guests are eating to capture some images of our cameras of the wedding so far for sharing Instagram (with the couples permission of course!) It can be a bit hit and miss in our experience getting the connection to work (you need to select the camera in the wifi setting on the iPhone), but once connected it works well. Once connected to my phone, I was able to see what the camera was seeing, pretty much in real time, on my iPhone in the app. So, I could walk around, camera on my chest, looking at my phone, pretty much like many of the shoppers; however in my case I was controlling the camera and pressing the shutter on the phone! I found this really handy and powerful; much less scattergun than my previous approach for example. I was able to use a wider aperture (and hence a lower ISO) as I could actually focus the camera with the app, rather than relying on manual focus and depth of field. I had a throughly enjoyable afternoon with the little X100F. Since then, we have used the camera at wedding for the first time. Apart from a couple of niggling handling issues (the location of the Q quick menu button mostly) we were super impressed with it. Check back soon to our featured wedding blog to see the St Albans wedding we shot partly with this lovely little camera. Editing info; all images were shot in raw, and edited in Lightroom CC (release 2015.9, latest version needed to edit raw X100F files), using custom presets based on the Adobe versions of Fuji's Classic Chrome and ACROS film simulations. Don't forget to sign up below to receive more Fuji related news and updates in the future.